Stanley Kubrick's Opinion On 'Is Life Worth Living' Is The Antidote for Your Existential Dread! Stanley Kubrick’s Opinion On ‘Is Life Worth Living’ Is The Antidote for Your Existential Dread! “Yes, for those of us who manage to somehow cope with our own mortality. The very meaninglessness of life forces man to create his own meaning. Children, of course, begin life with an untarnished sense of wonder, a capacity to experience total joy at something as simple as the greenness of a leaf; but as they grow older, the awareness of death and decay begins to impinge on their consciousness and subtly erode their ‘joie de vivre’ their idealism, and their assumption of immortality. As a child matures, he sees death and pain everywhere about him, and begins to lose faith in the ultimate goodness of man. But if he’s reasonably strong, and lucky, he can emerge from this twilight of the soul into a rebirth of life’s élan. Both because of and spite of his awareness of the meaninglessness of life, he can forge a fresh sense of purpose and affirmation. He may not recapture the same pure sense of wonder he was born with, but he can shape something far more enduring and sustaining. 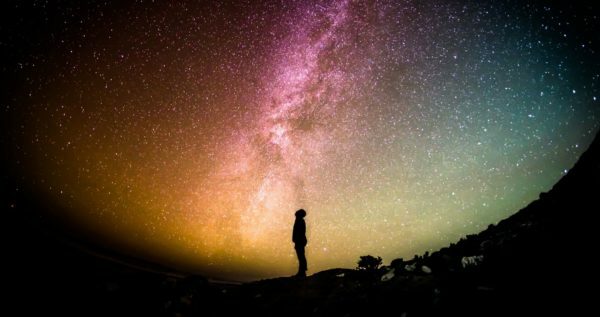 The most terrifying fact about The Universe is not that it is hostile but that it is indifferent; but if we can come to terms with this indifference and accept the challenges of life within the boundaries of death, however mutable man may be able to make them, our existence as species can have genuine meaning and fulfillment.